Live Life Like a Best Seller: You Just Have to Laugh . . .
. . . at Yourself. Living in a new country definitely comes with it challenges and advantages. I find that I am constantly laughing at myself – when I butcher the language – trip over safety hazards (usually I just cannot read the warning signs) – or my credit card is not accepted – and I forget how to properly weigh my produce... The Serbians probably think I’m a crazy person - always laughing by myself! Then on the other hand, living overseas does have its advantages. We are forced to stretch and grow as people and as a couple - we are meeting new and interesting people every day - we're seeing more of the world - food and drinks are relatively cheap for us - and we are enjoying the laid back and social atmosphere of a small European city. I wanted to post a few more pictures of our home, and I also wanted to relay a few of the things that we have learned or found out about our new home. 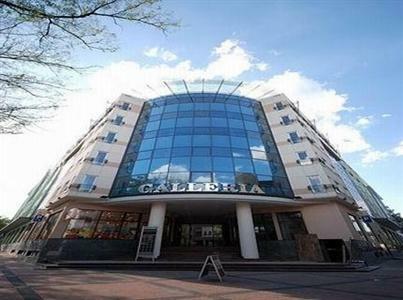 This is Hotel Galleria - a very nice hotel in Subotica, Serbia. I found a gym in this hotel and I joined it on Thursday! Interestingly enough, I met a very nice lady in the locker room today - Olja - and she spent a year of high school in Portland, Oregon! I was floored! Hopefully Chris and I can take her out to coffee in the future. The little silver car is ours! It is an Opel Astra! Chris drives her to and from work every day, so I am left to using my legs to walk around the city. Maybe I will invest in a bike soon. It seems that everyone bikes here. On our way to dinner the other day, we walked down this street in search of a new place to try for dinner. I just found it charming, so I took a picture! Although we tried to find another place, we were again drawn to Cafe Boss. The place was crowded and we had to wait to get a table on their patio. We shared a Chinese dish and then had a local dessert: a crepe with home-made-chocolate ice-cream-filling and heavy whip cream. Yummy, but not for every day consumption! This is the town hall at night! Every window has a story and apparently on certain days you can walk up into the clock tower. I will figure out when we can get up there. Beautiful! Last weekend, when Chris and I were at the grocery store, we met a lovely girl named Aleksandra who spoke almost perfect English. As we walked away, Chris said, "Lana, you should get her information and find her on Facebook, maybe you will make your first friend in Subotica." I am so glad that I took his urging because on Thursday, Aleksandra took me to Pizzeria Denis. This is the Pizzeria that I kept seeing on YouTube whenever I searched Subotica, Serbia. It is even more beautiful in person! I instantly fell in love with this place! This is Aleksandra. Thank you so much for spending time with me and welcoming me to your country! I truly had a wonderful time! This is the meal that we had at Pizzeria Denis. I cannot remember the Serbian explanation of this dish, but it tasted almost like Chicken Marsala stuffed with Prosciutto and cheese. I learned that when there are mushrooms in a dish, the exact name of the mushroom is listed, not just the general term "mushroom." Looking in on Pizzeria Denis. It's like a spa that you can have lunch and dinner at. Thanks, Lana! Keep it up. I love hearing about your adventures, and I am glad you are getting to know people. HI! This is so fun to read! Thanks for posting the link in your comment on my blog. I am not in Serbia right now. :( We are working in the US. But would love to Email you about when we may be back. Lafemmet@yahoo.com.... and we will be. We would love to come to Subotica, (Little Saturday) I have never been there yet. It would be so great to meet some other people like me. I think there is a Canadian in your area. He writes Canadian living in Serbia blog. Look forward to hearing from you. and reading more of your blog! I am glad to see that you & Chris are enjoying Serbia! I wanted you to know that I have family in Belgrade that speak perfect English. My cousin is a famous musician, and my nieces are absolutely charming and extremely well educated. I am sure that they would be honored to show you and Chris around and have you over for a meal. It is never a bad idea to get to know the locals!